The Rietz Collection of Food Technology is one of the few, perhaps the only, cross-cultural collections of culinary objects assembled to document historic technologies of cooking and eating. Collected by Industrialist Carl Austin Rietz during the mid-20th century, and acquired by the Department of Anthropology at the California Academy of Sciences in the 1970s, the collection documents the cultural development of technologies associated with preparing and eating food among numerous cultures and time periods. The Collection contains slightly less than 1400 objects, originating in ancient Palestine, Cyprus and Greece, Medieval Persia, Renaissance and Modern Europe, Colonial North America, 19th century Japan and China, and early 20th century Africa and Oceania. The collection is a unique resource for research in the fields of anthropology, history of technology, and food and culinary history, and furthers the use of material collections as a primary source for the research of cultural practices of the mundane and everyday. 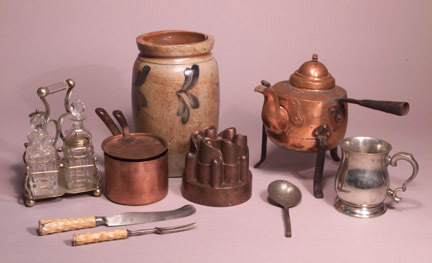 The objects in the Rietz Collection of Food Technology illustrate most of the fundamental developments of processes and practices associated with the human manipulation of food through time and across varied cultures. Common practices such as use of fire, cutting, fermenting, and brewing are illustrated through objects from the first millennium BCE to the early 20th century. Objects and tools composed of a variety of materials - stone, clay, bone, ivory, leather, wood, plant fibers, glass, and metal - illustrate the cultural development of food technologies for storing, preparing, cooking, serving and eating of food.